Dr Anthony had the unique experience of growing up around dentistry as both of his parents were dentists. From a young age, this instilled in him a passion to help others regain their self-confidence. After attending University and getting a first-hand opportunity to dive into the field, he knew he was born to be a dentist. 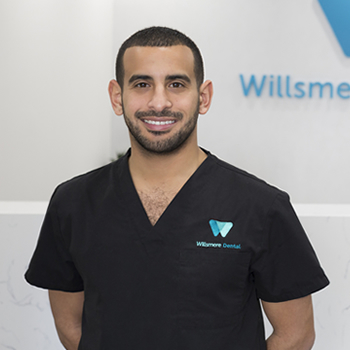 At Willsmere Dental, he enjoys having a positive impact on his patients each and every day, whether it’s bringing them out of pain or helping them feel better about their smile. Dr Anthony received his Bachelor of Health Sciences in Dentistry and a Master in Dentistry from the renowned La Trobe University. One of his favourite parts about attending school was getting to build relationships with classmates and professors from near and far. He continues to participate in various professional development courses in order to provide his patients with the absolute best service possible. In the future, he hopes to do more with implantology and orthodontics. Dr Anthony is a current member of the ADA and has taken advanced coursework relating to Invisalign. Outside of the practice, Dr Anthony is a semi-professional soccer player for the Northcote City FC and is a keen Essendon Football Club Member. He enjoys spending time with his family, watching movies, catching up with friends and travelling. Get to know more about Dr Anthony when you book your next visit with us. Need a Dentist Out of Business Hours? Willsmere Dental is proud to serve the Kew community and is able to provide flexible scheduling including after hours appointments. There is always someone available to attend to your dental concerns, even in the evenings or on a Saturday. We have appointments available until 8:30pm on Wednesdays and from 9am till 1pm on Saturdays. We welcome walk ins and emergency appointments. Contact us today or request your appointment online.